Tim Irvine received the prestigious Caretaker of the Year award at the Ontario Harness Horse Association banquet on April 14th 2010. This award follows a mere 2 race seasons after Tim embarked on his new career choice facilitated by Equine Guelph’s Groom One Program. “The industry cannot do without it’s grass root caretakers who truly love the horse” exclaimed Don. Bored with his work as a cook, Tim began volunteering at OVC’s large animal clinic and enjoyed partaking in activities such as foal watch. Equine Guelph’s director Gayle Ecker suggested the Groom One program and that really took Tim’s passion off the back burner. He no longer cooks but has been cutting out his slice of pie in the racing industry with growing success ever since. “The work experience combined with the online course helped a lot” says Irvine. Having very little experience with horses before the program Tim says learning anatomy amongst all the other horse care topics made his job easier. During the initial Groom One orientation session, Tim was introduced to trainer Casie Coleman. He began the work phase of the program as a volunteer at Coleman stables. After a few weekends Irvine was hired on as care taker for 2 Standardbreds. Still working through the online portion of the program - Tim experienced his first win on June 2, 2008 at Grand River Raceway with Shanias Legacy. His charge grew to 5 horses and the wins increased to 22 in his first year of grooming! Casie Coleman is happy with how Tim has worked out; "I was very pleased to hire someone from the course. This student's been here about two years now and is working out well,” says Standardbred trainer Casie Coleman. “He had been taught quite a bit through the program, and I could then teach him my way of doing things for my stable. I would be pleased to hire students from that program again." In his second year on the job Tim’s newly acquired skills and talent are shining with 31 wins (Just one win shy of the barn record). With the 2009 Caretaker of the Year award under his belt, Tim looks forward to expanding his knowledge in the harness horse industry. His base of knowledge is opening up opportunities to jump into the driver’s seat. 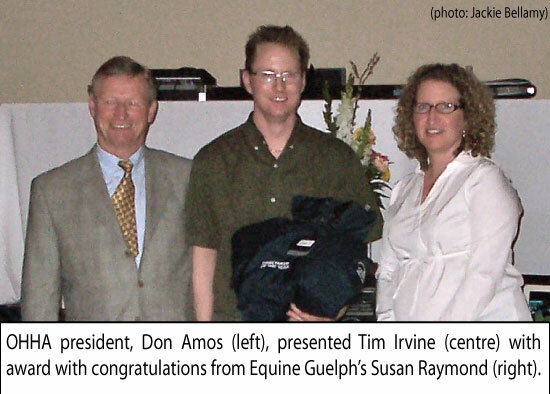 Tim’s future plans also include returning to be a guest speaker for Equine Guelph’s Groom One Program. 519-824-4120 ext- 54205 for more information on Equine Guelph’s Groom One Program. Registrations are currently being accepted for the online course beginning May 17, 2010.